Trinity College (Betula utilis var. 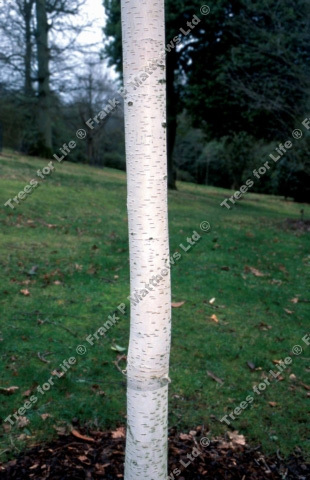 jacquemontii 'Trinity College') is a good new jacquemontii birch variety with a gleaming white trunk from an early age. Trinity College is quite an upright tree, graceful and light in form. A good choice of tree for a smaller garden as this tree will reach a height of up to 6 metres (20 foot) after 10 years. Trinity College is supplied at a height of between 1.5 and 2.4 metres in a 10-15 litre container for year round planting and better results than from either bare-root or rootballed stock. The size range we give on the Trinity College is quite large as it depends when in the year you purchase them and how the weather has been. Generally, if you buy a Trinity College from us shortly after August, they will be at the smaller size range e.g. 150-180cm. If you buy just before August, they will most likely be at the 180-240cm range. This is because we grow our Trinity College from August to August. 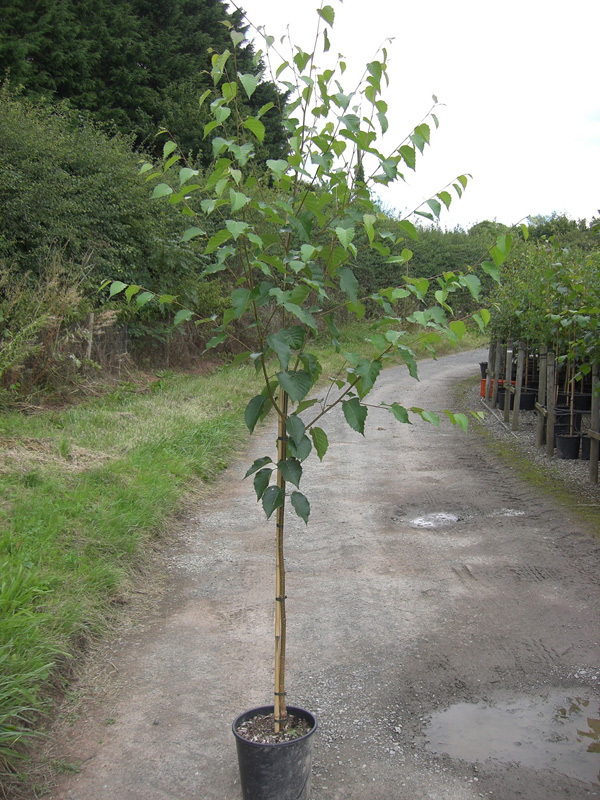 We receive some requests asking for straight stems with no knobs, bulges or bent bits at the base of the tree. As the tree is grafted onto different roots to improve the quality of the tree, this is not possible. Mother Nature is a hard faced, stubborn and willful entity that we have little or no effect over despite our best efforts. If we are out of stock of Trinity College then Betula Edinburgh is almost identical. The only difference we could find was Trinity College may have white bark sooner.